Remember When Youth Culture Was Not Served on a Platter? 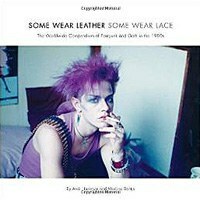 Some Wear Leather, Some Wear Lace offers a thoughtful and stunning visual and oral history of '80s postpunk and goth. Some wear makeup on their face. Some too hot, some too cold. Some have listened to the things we said. These were the lyrics of a 1983 song by the postpunk/goth band Sexbeat. The opening line is a fitting choice for the title of Andi Harriman and Marloes Bontje’s new book, which describes itself as a ‘worldwide compendium of postpunk and goth in the 1980s’. Originally funded through a Kickstarter crowdsourcing campaign (most of the funds went to the costs of reproducing photos) its publication is a true reflection of the DIY ethos that it celebrates. The postpunk/goth era is notoriously difficult to define, and so the authors do not even try. While delineating the period as roughly 1978 – 1992, they explain at the outset their aim is not to define genre or subculture, but rather to celebrate the individual creativity of those, performers and fans alike, who were part of that scene. In this visual and oral history, the very amorphousness of the line separating performers from fans reveals one of the key characteristics of the scene. “The show was both on stage and in the audience,” as one contributor put it – for with their dramatic outfits, makeup, hair fashion and personal styles the fans could and often did draw even more attention than those on stage. Dramaticism, write the authors, “is the one universal idea that is centered around postpunk and goth.” The book offers this in stunning visual display: black and white and full colour photos of the people and the styles, both staged and candid, as well as set-lists, posters, album art, and other ephemera of the era, convey the paramount importance of drama and creativity. There’s even an entire photo collection of footwear. The book offers glimpses into parts of this history that remain surprisingly dark and hidden, even by goth standards (and despite the amount of analytical attention the scene has received from academics). These are among the most fascinating bits of research the authors and contributors provide. The emergence and challenges of the scene in remote Finland. The struggle to build postpunk/goth community in the Soviet Union, where obtaining dark fashion was as difficult as obtaining albums (and where goths faced persecution of a very different sort from the street harassment they sometimes encountered in the West). The growth of the scene in a Spain slowly emerging from fascist dictatorship after the death of Franco. The written content is minimal – the focus in this book is on visual history – but the depth and quality of research that went into the chapters’ written components is first-rate and fascinating, nonetheless. These take the form of short essays, peppered with interviews from band members and club-goers alike. It’s a delightful boon for researchers, for music fans searching for new (old) bands to experience, as well as for those simply wanting to revisit the nostalgia of the era (or mine it for fashion ideas). Novices and veterans alike will benefit here. Even I stumbled across some bands I hadn’t heard of before. Fashion, of course, was central to postpunk and goth. An eclectic range of randomly outrageous fashion eventually coalesced into the ‘dark’ look that is today associated with these genres. Balancing style and authenticity is harder than it sounds: “the goal was not to replicate – a goth had to appropriate and re-examine, to look similar but also distinguishable as an individual.” A challenging concept that was often time-consuming in practice. Interviewees offer elaborate tips and instructions on the complex hairstyles and makeup artistry they used to achieve their unique looks. Today’s goths can purchase intricately ripped and torn clothing for hundreds of dollars at a wide range of internet and specialty clothing shops; but a far different class identity originally permeated the scene: “…poor or not, the goal was to be different from others by employing ingenuity.” Club-goers scoured charity and thrift stores, recycled their grandparents’ clothes, and sewed their own. The heyday of this particular postpunk/goth moment is tagged by the authors as the mid-'80s. The opening of London’s famous Batcave club in 1982 is often inextricably tied to the emergence of goth as a distinct genre, reflecting the merging of a recognizable, yet still infinitely creative, style and sound for a few years. Thereafter, the flourishing creativity and experimentation of its bands and artists, which defined the genre’s immense potential, became so pluralistic that it began to fission into more distinct scenes. Some bands came to integrate more electronics into their work, pioneering the industrial and Electronic Body Music (EBM) genres. Other bands went the other direction, toward a more guitar-focused sound evocative of rock 'n' roll and even psychedelia: thus gothic rock was born. Well, the authors have done something, at least – offered a stunning and inspiring visual showcase of what this creative era had to offer. The bulk of this thick book is comprised of photo collections, and offers a lush visual representation of an era that was dark and pale in tone yet rich and vibrant in energy and creativity. Well, you can buy the book, and DIY or not it’s sure to please both the nostalgic postpunk in their 50s on your Christmas list, or their restless grandchild who’s casting about for inspiration. Will the ethos of postpunk and goth rise from the dead? Or should it even bother? The reflections of one of the era’s interviewees seem appropriate in closing.